Unfortunately, I have not been able to spend much time with the Jag these last few months, mostly the result of a very busy year, more time spent on two wheels, and a new addition to my family (see the photo). Still, despite the minimal time spent, there are a few noteworthy items about our experience with the Jag since our last update. 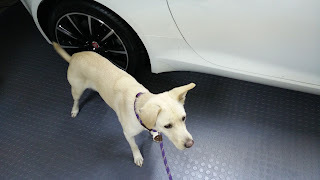 First, just the other night, I was adjusting the positioning of the Jag within its garage space, which is in the third bay of a three-car garage, meaning it has its own dedicated garage door. I must say, it is kind of insane just how wide the Jag feels from behind the wheel at parking lot speeds. Low speed maneuvers, especially in tight spaces, really highlight the terrible rear visibility when the top is up as well as how tall the front fenders feel from the driver's seat. Mix in the generally low seating position, inching the big Jag forward into its garage space from a rather steep driveway was a tad nerve wracking as I definitely did not want to accidentally bump anything. Jaguar really should consider, especially on the convertibles, including the back-up camera as standard equipment and possibly an option for dropping both driver and passenger side-view mirrors down (versus just the passenger side one) to allow for easier parking and protecting the flanks of such a pretty car. During the last six months, the Jag has also gotten its first proper service visit, the result of a need to address a few niggling issues, including a door rattle that had been present since almost day one. Jaguar, as a luxury manufacturer, does a good job getting dealers to provide a level of service befitting its customers. A Jag loaner, an XF 2.0t was provided, and the slinky convertible was taken in and they made an effort to be as timely about it as they could. But in thinking about the luxury service experience, it is hard to overlook the fact that some new players, such as Hyundai, have flipped the whole market on its head by starting to offer white-glove level service to certain customers. That includes free pick-up of the customer's car, dropping off of a loaner, and essentially making the service experience much less painful. Given the price premium that Jag's command, I cannot help think how much more enjoyable the ownership experience would be if Jag upped its service game even more. With warmer weather on the horizon, although a potentially seriously wet rainy season due to El Nino, we should have more fun experiences to share at our next update. Oh the horror! After nearly 10k miles and over 3 years of ownership, I finally had my incident with the big Beemer. Of course, it would have occurred during a two-up ride with my wife, but luckily, it was a rather minor drop. What happened was that we were stopping at the intersection of Glendora Ridge Road and Glendora Mountain Road and I had ridden the bike onto a dirt embankment to try to turn it around. 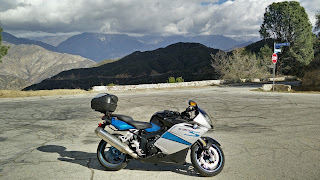 It was a bit steeper than I anticipated and misjudged the amount of clutch slip for the slow maneuver. Before I knew what happened, the weight of the bike had teetered dangerously far to the left and at what was basically a standstill, the Beemer tipped over onto its side like a wounded buffalo. Luckily, we both jumped off before the bike hit the ground, and the presence of the frame sliders meant there was basically zero damage, except to my ego. The only signs that something had happened was a slight bit of scuffing on the left frame slider and a bit of dirt trapped in the left side mirror housing. Before it happened, this year's Detroit Auto Show was thought of by many as a real dud. Many of the usual auto journo channels had largely written the show off due to a lack of major announcements and those few announcements that were anticipated were vehicles that nobody thought would actually catch anyone's attention. Yet, this year's Detroit Auto Show ended up revealing a surprising amount of technology that seems to foreshadow the future direction of the automobile in America. There were a few alternative fuel vehicle announcements, a few autonomous vehicle reveals, and a whole lot of focus on turbos and horsepower. 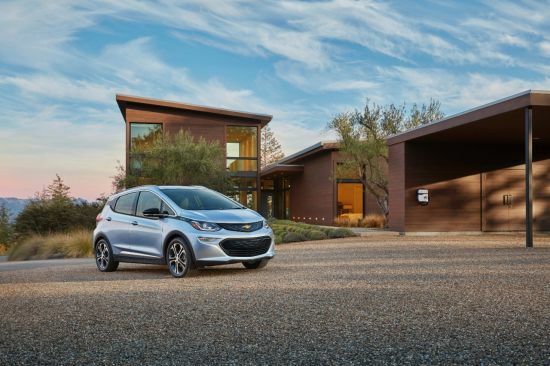 Key among the alternative fuel vehicle reveals was the production version of the Chevy Bolt, the first expected electric vehicle with a 200-mile range, the Bolt is a 180-degree turnaround from the company that killed off the first commercially viable EV that it itself produced. Using battery technology from LG Chem, the 60-kWh battery pack fills the floor and works in conjunction with a set of electric motors to deliver solid performance in a passenger friendly package. It is unfortunate that Chevy has chosen to design the vehicle as a tall CUV style small car. The proportions are almost Seuss-ian in nature, appearing somewhat comically tall with a shortish wheel-base and wheels that look too tiny for the height. The design is trying too hard to hide its odd proportions by using tapering side windows and lots of surfacing and character lines along its flanks. Many may see the appeal of a tallish small car, but as an EV, the increased frontal area is a serious sacrifice of aerodynamics. Editorial: Does Acura Need to Fix the 2016 NSX? When the Acura NSX made its debut back in 1990, people were skeptical that a manufacturer like Honda could build a super car. "What is a Japanese company that builds people movers for a living doing trying to building a mid-engined super car?" 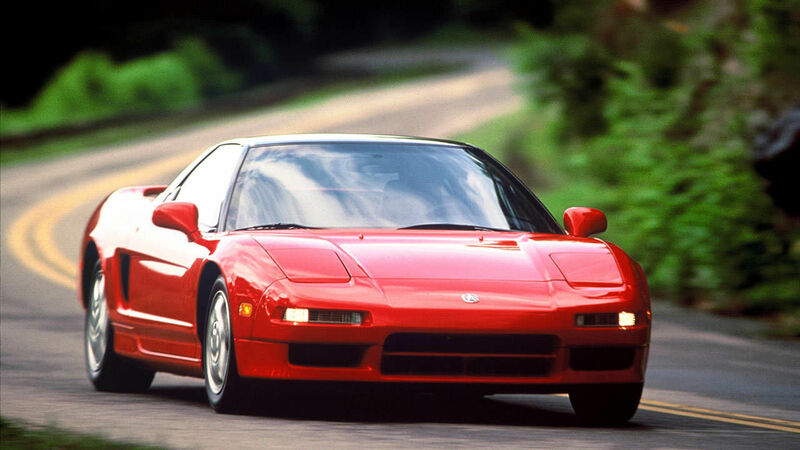 But rather than some tepid, boring, wannabe sports car, the NSX stunned the automotive world. This was a car that performed as well as, or some times better than, super cars from Europe. In fact, the NSX's performance was so stunning, that it actually made manufacturers like Ferrari and Lamborghini worry. "These guys from Japan built a car that rivals the performance of our cars, costs half the price, and starts every time!" If you own a modern European super car, you can thank Honda for the fact that your car will start most of the time. 2015 turned out to be a much busier year for the two of us than either of us had expected. Our day jobs ended up consuming quite a bit of time, which meant there was not quite as much time to focus on test drives and the wheeled world in general. That does not mean that there were not moments in 2015 that really stood out for us when it comes to our favorite wheeled transportation methods. Here are a few moments that we truly enjoyed from 2015, some of our most popular posts, as well as a look at what to expect in 2016.